Geneva - Between 8 July and 26 August, 2014, Israeli forces conducted an estimated 60,664 raids (launched from land, air and sea) into the Gaza Strip. 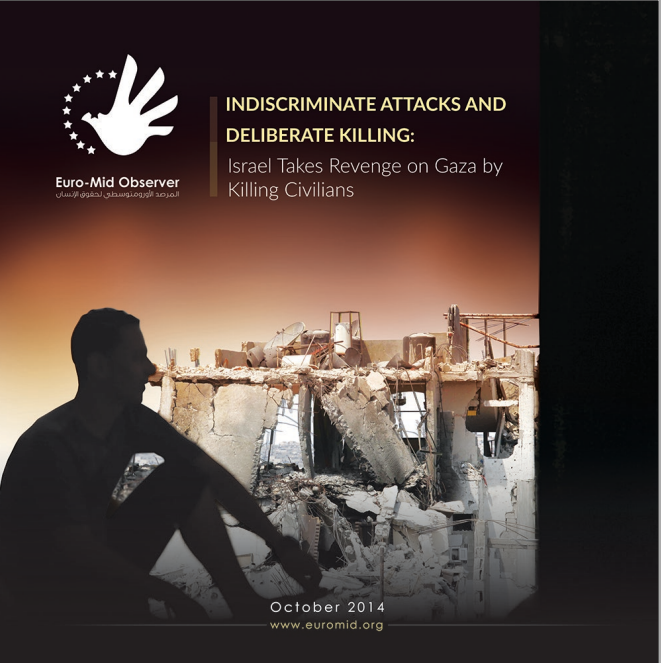 This report documents that in many cases, these attacks were indiscriminate. Not only did Israeli forces fail to take sufficient measures to protect noncombatants, including children and the disabled, but in a number of instances they deliberately targeted locations with concentrations of civilians. Reports from physicians on the ground strongly suggest that Israel deployed “unconventional weapons” (nail bombs and DIME munitions), which are designed to cause maximum damage and thus are not considered permissible in densely populated areas -- either legally or morally. According to international law, attacks are considered indiscriminate when they are not directed at specific military targets, measures are not taken to limit the effects and no attempt is made to differentiate between combatants and civilians. Under this definition, the Euro-Mid investigation documented here demonstrates that Israel committed numerous indiscriminate attacks in Gaza during the July and August aggression. Likewise, this investigation shows that the so-called “warnings” issued by the government of Israel, typically in the form of telephone calls or “roof knocks,” were insufficient to offer protection. The actual strikes typically occurred less than two minutes after the warnings and in a few cases, less than one minute. There was no time to flee – particularly for those with disabilities – even if there was somewhere safe for them to turn. At the same time, Israeli armed forces obstructed emergency responders from reaching the wounded for long periods of time. Based on these testimonies, Euro-Mid concludes that Israeli armed forces deliberately and knowingly targeted massive numbers of noncombatants, even though they already knew (or should have known) that their actions would result in a large number of civilian casualties. Therefore, our recommendations include a thorough investigation by the United Nations, with backing from the Security Council – or, if vetoed due to a longstanding practice of protecting the Israeli government from censure, the General Assembly. Likewise, we call on all state parties to the Geneva Convention to insist on conformance with its provisions in their respective national courts. The reconstruction of Gaza is needed for Palestinians to be able to live. However, without accountability for crimes and protection of human rights, it will be a life without dignity or hope.